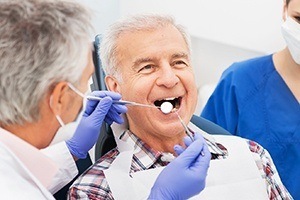 Whether you’ve been wearing dentures for several years or you’re about to become a new denture wearer, you want to feel confident in your smile. No one wants to worry about dentures that move or click every time they open their mouth to eat, speak, smile, or laugh. Implant-retained dentures offer the security of dental implants and the aesthetic appeal that only a complete denture can provide. As a skilled implant dentist and experienced provider of beautiful dentures, Dr. Scott can give you a secure and attractive new smile with implant-retained dentures. Aside from the obvious gap in your smile, there are other problems that almost always arise as a result of tooth loss. Some can be seen and some cannot. One that is not visible is malnourishment. Many people with missing teeth simply eliminate foods from their diet that are difficult to eat. Unfortunately, these are often healthy foods, such as fresh fruits and vegetables. Another invisible consequence is the impact tooth loss has on a person’s willingness to socialize. Your smile has a lot to do with how well you interact with others and your ability to meet new people and grow friendships. A visible alteration that happens with tooth loss can be the shape of your face. When teeth are missing, the roots that had stimulated your jawbone aren’t there anymore. Then, bone tissue begins to degenerate and your jaw shrinks. As a result, your entire face may look different and more aged. Because traditional dentures only rest on top of your gum tissue, they can’t do much to generate a healthy jawbone. Implant-retained dentures, on the other hand, can do just that. The dental implants that are surgically embedded in your jaw to anchor your dentures recreate the relationship between tooth root and bone. In this way, your jaw is stimulated every time you bite, and healthy new bone tissue continually grows to keep your jaw shapely and your face looking younger. And of course, implant-retained dentures eliminate any concerns about your dentures shifting or even popping out at the most inopportune times. Just as one dental implant can be placed in your jaw to replace a single missing tooth, several can be implanted to secure a full denture. With advance planning based on detailed X-rays, Dr. Scott will strategically position the implants along your jaw. Each one will be placed to take advantage of the greatest bone density in order to provide the strongest foundation possible. Implant-retained dentures are more often used to replace your lower arch of teeth because these dentures slip more than upper dentures. However, Dr. Scott can provide implant-supported dentures for your upper arch if necessary. After the minor oral surgery to place your implants, we’ll give you a temporary set of overdentures to protect your healing gums and allow you to chew and smile. 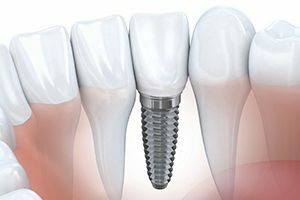 As you heal, the dental implants bond with bone tissue. This bond is what provides the secure footing for your dentures. In a few months when you’ve completely healed, Dr. Scott will attach the implant-retained dentures. 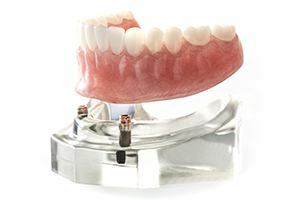 Each implant is outfitted with a small abutment that simply clicks into a customized metal framework positioned along the underside of your denture.